Someone’s posted embarrassing photos of you on social media. You might be humiliated, and maybe even suffer job consequences, as we saw on this post about online reputation management. Or you can take action! This helpful infographic from WhoIsHostingThis gives you the step-by-step for Facebook, Twitter, Google+, and Instagram. Be careful who you allow to see what you post. Avoid taking photos that could come back to haunt you. But if it’s already too late for that, I recommend you take action sooner rather than later –before the photos in question are widely seen, and perhaps even shared or downloaded. 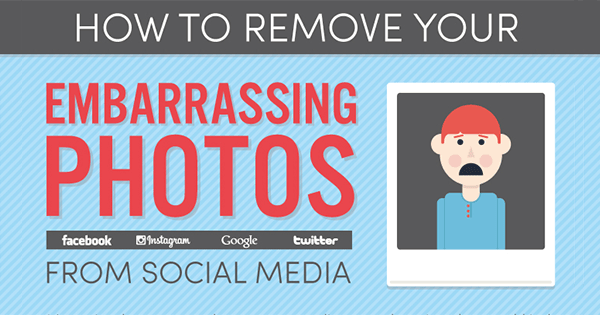 So whether the photos are from friends, frenemies, cyber bullies, or mean exes – take steps now to remove embarrassing photos from social media! Be careful what you post because 1 second can create branding nightmares, pronto. I’m huge on waiting for a few before posting anything on social media. A kind of buffer zone lol…. Thanks for the helpful share! So true, Ryan! Glad you liked the post, and thanks for your comment!